Vet oncology study examines shorter chemotherapy intervals for canine osteosarcoma with carboplatin and doxorubicin. 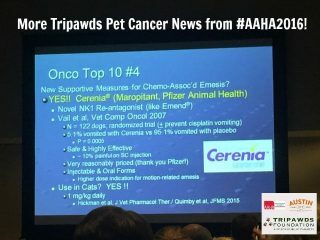 Tripawds pet cancer news and opinions about Palladia, Cerenia, CT scan staging and more from the AAHA 2016 conference sessions. 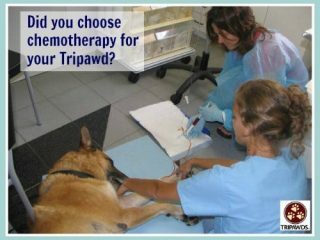 Struggling with the chemotherapy decision for your tripawd? See how other parents coped with pet cancer chemotherapy decisions and regrets. How Many Chemotherapy Sessions are Best for Osteosarcoma in Dogs? 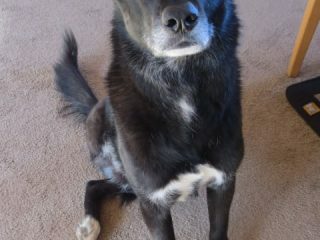 Colorado State studies best number of chemotherapy treatments for osteosarcoma bone cancer in dogs. Learn about the important of cancer tumor biopsy types and procedures for diagnosing dog bone cancers. 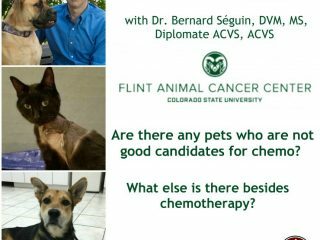 Dr. Johnny Chretin of VCA West Los Angeles discusses shortages of chemotherapy drugs for canine cancer patients and Tripawds provides recommendations for cope with low supplies. Interview about chondrosarcoma bone cancer in dogs with information and treatment options as shared by Dr. Johnny Chretin of VCA West Los Angeles Animal Specialty Oncology Clinic.